America's Most Colorful Hillbilly Band! The Maddox sound was fun, catchy and made you want to dance. 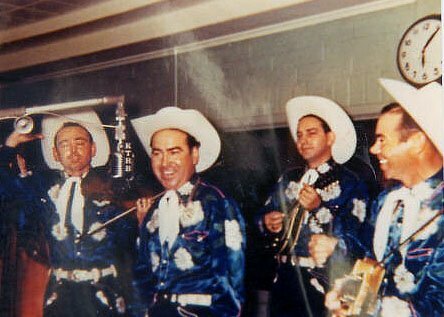 They were clever and Don and Fred were the comedians of the group and they became famous on the radio and the Maddox Brothers and Rose began performing around the region. 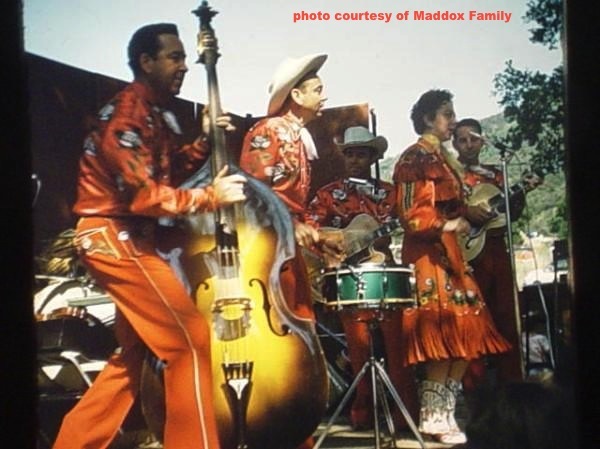 The string bass player was the comedian in many of the early swing bands, but it was the rockin’ sound of Fred’s bass combined with the songwriting and the wit of the Maddox family that made hillbilly boogie famous. 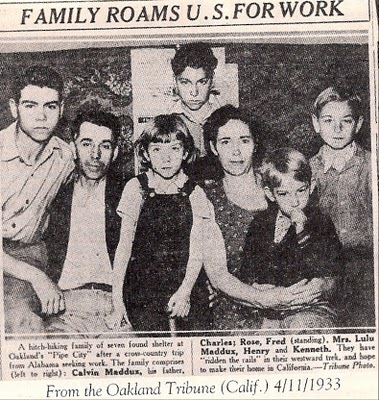 When the Maddox boys returned from war and returned to Modesto, they started recording and began wearing the flamboyant suits and made quite a name for themselves, touring across the country. 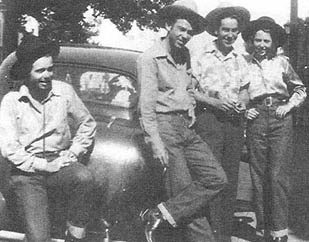 Through the years they would play the local places like the Uptown Ballroom and many other local “Honky Tonks” around the area like the El Rancho and George’s Playhouse in Stockton. The Riverbank Club House became the crossroads for a sound that now was known across the nation that would be host to many of the music legends of that time. Hank Williams made a memorable appearance here in Modesto and played a live performance on KTRB, then under the guidance of Chester Smith, himself a hillbilly music legend on radio ," the Maddox sound" became famous across the USA on radio, on recordings and their memorable live performances. 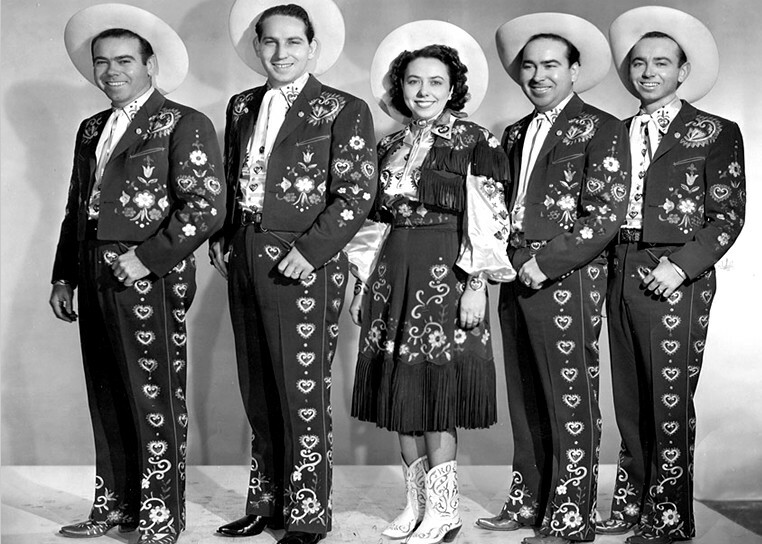 The Maddox Bros & Rose were known as “America’s Most Colorful Hillbilly Band”. 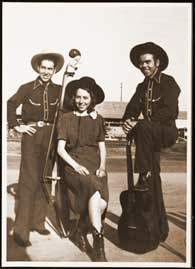 Fred’s bass sound influenced musicians across the USA, and in particular, one Memphis, TN based Bill Black who had returned to Memphis after the war. Bill Black was the legendary bassist for Elvis Presley in those early Sun sessions. “That’s All Right”, a cover of Arthur Crudup’s 1946 song, was recorded after an accidental uptempo rehearsal track. This new “rockin’” version was quickly recorded and sent to radio and radio went wild. The Rhythm and Blues that was popular up and down Highway 61 in the late 40s and early 50s, was blending with the hillbilly boogie slappin’ bass sound that made the music “Rock”. Bill Haley’s Rock around the Clock, also released in 1954 featured the rockin slappin’ bass sound. (1) Around the same time, Cleveland DJ Alan Freed would popularize the term “Rock and Roll”. KC “Don Juan” Maddox is still with us today and he has more energy and sense of humor than most any other 90 year olds you meet, or anyone for that matter! His voice is loaded with character and energy and we chatted about the origins of Rock and Roll, Rockabilly and the Maddox Bros & Rose Sound. ModestoView: How did the Slappin’ Bass sound start? Don Maddox: Fred just started with the string bass and he really wasn’t that good and it and he just slapped it to get this percussion sound and he would just beat on it. People would come to see us and say, “you have the best bass player” but he wasn’t that good, he was just slappin’ it like crazy and having a great time. Don recounted how a young Elvis would be on the same concert bill and Bill Black would sit in with the Maddox and Elvis would admire their flashy outfits, many that were made here in Modesto. Elvis commented to Don at one of these shows, “someday I will have a suit like this”. The Maddox influence was felt everywhere in music. According to Don, as the youngest, he learned how to play by going to the dances and watching the band play and after the war joined the band as the fiddle player and one of the chief comedians for their legendary sound. Their colorful live recordings are still available and some of their KTRB radio jingles are on You Tube. Don Maddox is still making music and his CDs and merchandise will be available very soon. See ModestoView.com for a list of links to recordings. Reverend Horton Heat’s Jim Heath spent some time with us when he played in Modesto recently and we talked about the history of Rockabilly, the Maddox Brothers and the roots of Rock and Roll. “Rockabilly wasn’t just Elvis and Bill Haley, it was a outgrowth of everything. It was the hillbilly people listening to R&B one thing lead to another”. Jim continues “Rockabilly has kind of been the kicking dog of the music business and I hope someday that Rockabilly will get its place in history. Whether that really happens or not, we’ll see, but that’s what I hope”. In fact, the word Rockabilly was used as a ‘hillbilly insult” in the early years and the term was not really used widely until the early 50s. 5 time Grammy winner, Marty Stuart, announces the 2013 MAMA (Modesto Area Music Awards) Lifetime Achievement award to Don Maddox of Maddox Brothers and Rose.